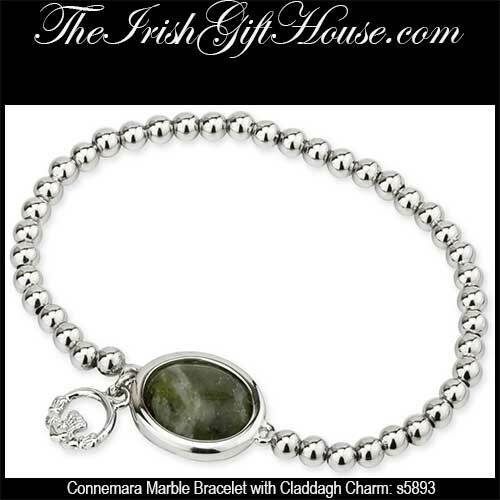 The Connemara marble that is featured in this Claddagh bracelet is the only natural green marble in the world; fittingly, Connemara marble is only found in Ireland. This Connemara marble bracelet features a double sided oval stone setting that measures 1/2" wide x 3/4" long along with a Claddagh charm that measures 3/8” wide x 3/8" tall. The beaded rhodium plated stretch bracelet is strung on an elastic cord and it will fit most women's wrists. 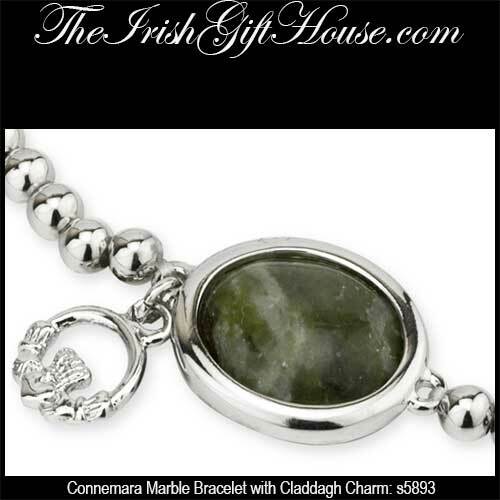 The charm bracelet is made by Solvar Jewelry in Dublin, Ireland and it is gift boxed with Connemara marble and Claddagh history cards, complements of The Irish Gift House.